Fruit-belt farms in Southwest Michigan have increasingly struggled against agricultural imports from the west coast. In order to survive, many have found other outlets for their produce. For the Cranes, who had been farming their acreage since 1916 survival took many forms. It began by pressing cider in 1968 and then Crane’s Pie Pantry opened in 1972. The restaurant produces something like 30,000 pies each year. More recently, the operation split between brothers and sisters. Laura Bale and Becky Crane took over the thriving restaurant, but continued to innovate. Wine and hard cider came next and Crane’s Winery was born. The tasting bar is integrated into the restaurant, so there is a great deal of activity taking place around that space. Despite appearances, the bar is staffed separately and it is a serious part of the larger business. If you stop in for the pie, you should definitely sample the wine and vice versa. It’s all good. Much of the wine is made at Fenn Valley, but winemaker Eric Heavilin is involved in every step and quick to point out that some production takes place on premises and hopes to gradually shift the operation to Crane’s. 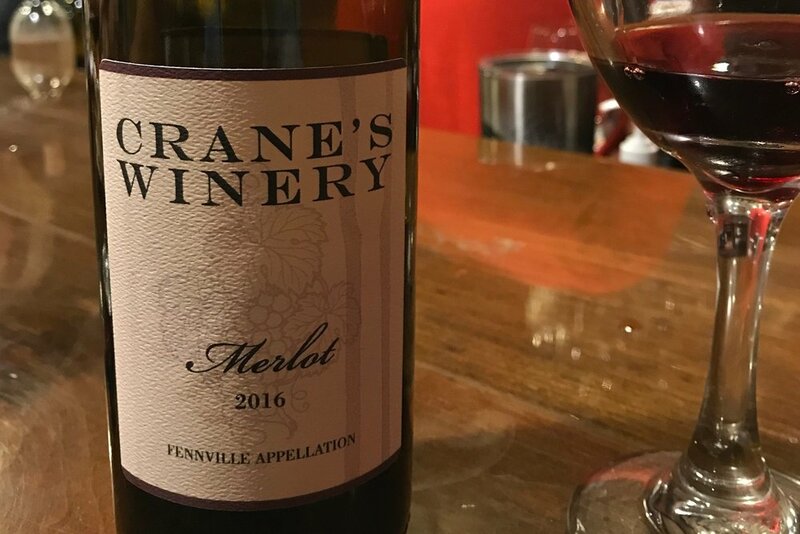 Heavilin, who learned from local winemaking legend Doug Welsh, has been in the business for 24 years and moved from Fenn Valley to take over at Crane’s. His experience is demonstrated in the overall quality of his wine. Crane’s currently bottles 15,000 gallons of wine and cider annually. They produce an extensive list of white and red wines. It is simply amazing that all of the grapes in their portfolio grow well in the region. I was only able to sample a few of the offerings, but they were uniformly well made. Among the whites, there was a Sauvignon Blanc that had crisp acidity, nice balance and rich citrus notes. Although that was probably my favorite white wine, I also tried a very solid Riesling, Pinot Grigio and Fume Blanc. All were worthy of note. For reds, I tasted only three. Among them were a very nice Bordeaux blend and a second, well constructed, blend of Chambourcin and Merlot. The real standout was the single-varietal Merlot. It had excellent fruit with great structure and complexity. It is very well done and a medal-worthy wine. Let me reiterate that you should not be put off by the multitude of activities at Crane’s. This is a serious producer of fine wine and you should stop in just for that reason. Of course, you should also sample the pie, which is outrageously good. So pay them a visit and after you do, let me know what you think. Claude Dablon was a Jesuit missionary active in Canada and parts of Michigan in the 17th century. It is said that he cultivated and made wine from native grapes, which would place him among the continent’s early winemakers. It is in honor of this early producer of American (and perhaps Michigan) wine that Dablon Winery and Vineyard is named. Since opening in 2009, Rudy Schafer has been the head winemaker. He carved a couple hours out of his busy schedule to show us around the winery, fill us in on many details about the operation and step us through some of his wines. As of this writing, Dablon has about 41 acres under vine spread across two sites and another three to four acres are planted each year. This results in 10,000 cases annually and Schafer hopes to increase that incrementally to 15,000. The challenges to viticulture at the Dablon sites are primarily winter cold and late spring frost. 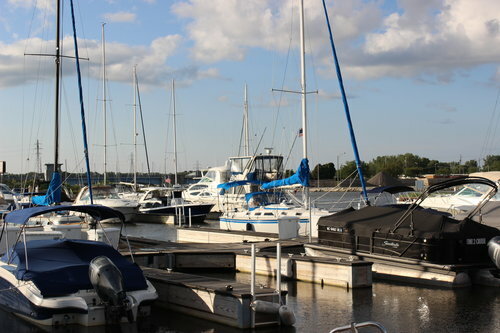 The rolling hills and moderating affects of Lake Michigan lessen the impact, but additional winter precautions are necessary. Straw is used to cover the grafts on the vines. Schafer prefers this to covering the grafts with earth—as they do in the Finger Lakes—because there is less potential for damaging the vines. In any case, it allows Dablon to grow a large variety of vinifera and hybrid grapes with less regard to extremes in temperature. I tasted about a half dozen wines during our visit. Like many of the wineries in Southwest Michigan, I was simply blown away by the quality of the wine. Among the whites, I tried an excellent Seyval Blanc and an equally great Riesling, but Dablon is just killing it with their unoaked Chardonnay. Nice mouthfeel, minerality and citrus notes were dominant features. It is a perfectly balanced wine that will stand up against any Chardonnay in America. Reds were equally well crafted. I loved the Cabernet Sauvignon Reserve and the single-varietal Syrah, but the Cabernet Franc was just over the top. It was full of ripe, dark fruit that was accented by nice pepper notes in a beautiful finish. For me, it was the best wine of the tasting. More than just good wine await potential visitors. The modern, well-appointed tasting room offers room to spread out and there is additional space outside. Views of the vineyard make it a real wine-country experience and the staff is both knowledgeable and customer oriented. This one is a bit of a no brainer. Dablon Winery and Vineyard is absolutely a must-visit venue. 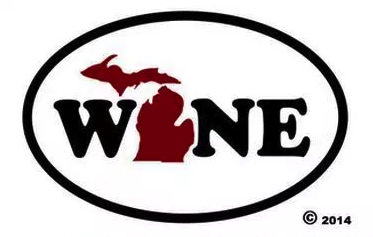 You cannot claim to know anything about Michigan wine until you have stopped by this producer. So after you do, please let me know what you think. At the start of the 20th Century, Edward K. Warren was the largest landowner in the United States. His fortune was based on the use of “feather one” which was used to replace whalebone in women’s corsets. This innovation involved a world-wide manufacturing empire that was based in Three Oaks, Michigan. Warren was, incidentally and perhaps ironically, a strong and early advocate for prohibition. The historic factory had long been abandon and the region was reeling from the impacts of the recession. Bill Welter recently returned from Scotland, where he went to study golf and simultaneously discovered whiskey. This new passion ultimately became a shot in the arm for the economy of the Three Oaks. In 2010, Bill and Johanna Welter purchased the abandoned factory and established one of America’s top “grain to glass” distilleries. Every aspect of production at Journeyman Distillery is performed onsite from milling to distilling and all from locally-sourced materials. In 2015 a restaurant was added, along with a very impressive food program that incorporates elements of spirits. The historic integrity of the old factory was largely maintained and that effort resulted in an extremely charming space. Areas on the upper floors were renovated for use as event venues. Journeyman hosts a staggering 100 weddings annually along with an equal number of corporate events. In short, the place is humming with positive activity and along the way 140 new jobs were created. More than the whiskey gives a nod to Bill’s time in Scotland. Welter’s Folly is a Scottish putting green constructed behind the distillery. It is part of Bill’s other passion. Open at no cost to the public, it is a fun recreational distraction for visitors or local residents. Of course spirits are main event. As of this writing, there are ten whiskeys that include ryes, single malts and bourbons. A range of other liquors are also distilled and everything is both kosher and organic. I limited my tasting to ryes and a couple whiskeys and I found them to be of extraordinary quality. I’m a fan and I encourage you to give Journeyman Distillery a try. After you stop in, please let me know what you think. 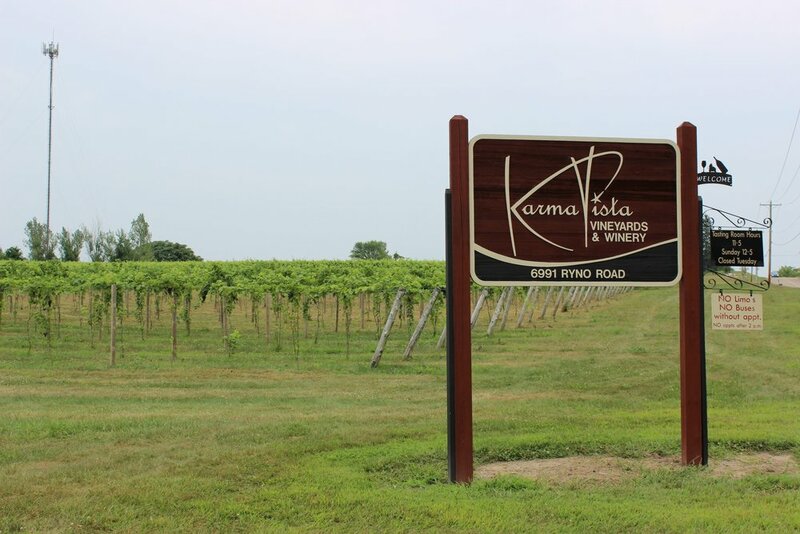 For over 170 years, seven generations of the Herman family have raised crops on the Southwest Michigan property that is now home to Karma Vista Winery. The land is in the fruit belt, so that has been the primary agricultural focus. More recently, like large tracts of the local farmland, the farm grew grapes for Welches. As that market began to fail, owner Joe Herman began planting vinifera in 1997 with an eye toward making world-class wine. The site is ideal for wine grapes. Karma Vista sits five miles from Lake Michigan and has 200 feet of elevation with good orientation. The glaciers of the last ice age receded to leave gravel deposits that lie just beneath the surface, which provides excellent drainage and some minerality. The proximity to the lake also moderates temperatures making a wide range of vinifera and hybrids possible. There are currently 60 acres of wine grapes at Karma Vista. Eighty percent are sold to other producers and the remaining fruit is used to bottle between 3000 and 4000 cases under the estate label. The boutique operation bottles a variety of labels. There were probably two dozen wines available for purchase at the time of our visit. Herman will tell you that Pinot Noir and Syrah are the signature grapes, but our tasting revealed a range of other well-crafted, praiseworthy wines. We tasted about a half dozen of the Karma Vista offerings and all were wines of note. I must admit that the single-varietal Syrah was extraordinary with much fruit mid palate mingling with a lot of pepper in a nice, long finish. The real surprise of the visit, however, was the Marquette. I have tasted quite a few and I’m not necessarily a fan, but the Karma Vista example was just off the charts. Big fruit and complexity were the hallmarks of that wine. It demonstrates what is possible with Marquette. It is a potential award winner and was my favorite of the tasting. The tasting experience was everything we expected. The staff is well trained and the tasting space is well organized and nicely decorated. There is a nice view looking out toward the lake and with all the acres under vine, it feels like wine country. Should you visit? Of course you should. If you are anywhere near Karma Vista Winery, make a detour, stop in the tasting room and prepare to be blown away. 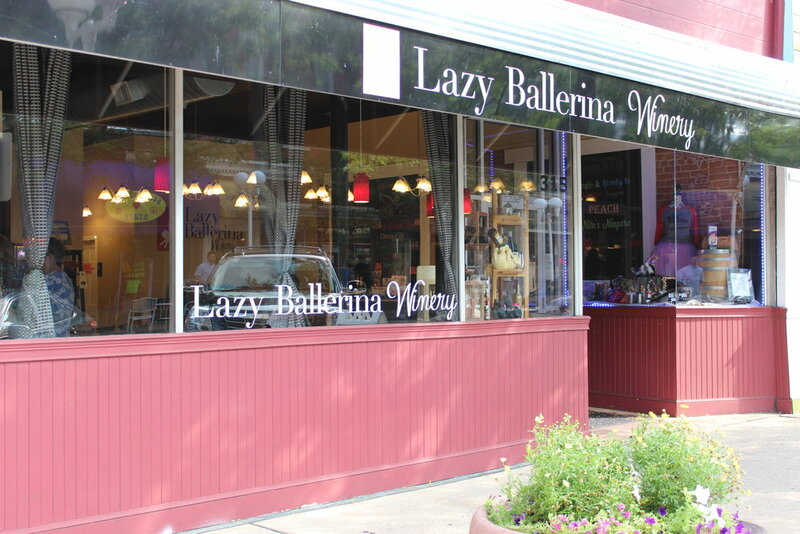 You will not believe the quality of wine produced in this part of Michigan. So after you stop in, please let me know what you think.